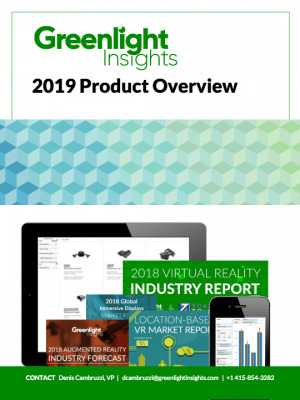 SAN FRANCISCO (April 9, 2019) —Greenlight Insights predicts that by 2025, the top 100 global manufacturers by revenue will leverage product marketing solutions through VR/AR applications that offer interactivity and configurable views during the sales process with B2B and B2C customers. Notable examples include Audi's Cloud Configurator, which employs real-time 3D rendering to dramatically uplift the automotive price quote experience, resulting in higher engagement, interaction, and customer satisfaction. Real estate brokerage Redfin has also employed 3D visualization and complete virtual walkthroughs as standard across all of its listings in over 85 markets in the US and Canada. The use of xR to market and sell a product is among the newest ways manufacturing companies, brands, and retailers are enabling their sales team to be more productive, but organizations have a challenging task ahead in determining which of the many immersive product marketing solutions on the market today best suits their organizational requirements and constraints. To offer consistent, relevant and personalized prices for customers, companies need to ensure solutions provide enough scene detail, especially toward the upper bounds, to enable enough visual fidelity for accurate virtual representations of products. Additionally, solutions must meet a company’s system requirements for hardware, software, infrastructure, and any other indicators of an above-average computational load when weighed against competing solutions. However, companies also must make sure immersive product marketing solutions are easy to use, versatile, and have enough secondary features that enable sales processes. “Companies that ignore the potential of immersive product marketing do so at their own peril. Sticking to outmoded visualization strategies means sales team have to work twice as hard on educating prospective customers about the way their product would appear or behave in their own homes or spaces,” observed Mr. Kuang. “Saving time by educating customers automatically and more efficiently than ever through VR and AR technology means more closed deals, faster,” said Mr. Kuang. Immersive product marketing solutions refers to software and services to product sellers to enhance marketing and sales efforts oriented towards business clients or individual consumers. xRS Week gathers the most influential leaders in the virtual and augmented reality industry each year to facilitate strategic thought-leadership and forge new business relationships. xRS Week 2019 is taking place October 16-18 in San Francisco. Follow news and updates from the event on Twitter at #xRS19. 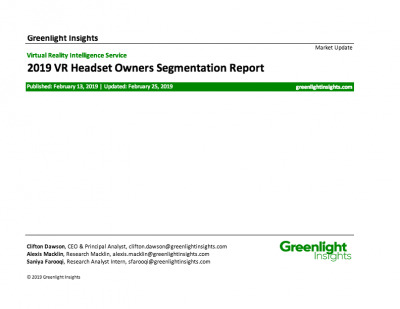 Greenlight Insights provides proprietary market research, consulting, and events about the future of virtual and augmented reality. 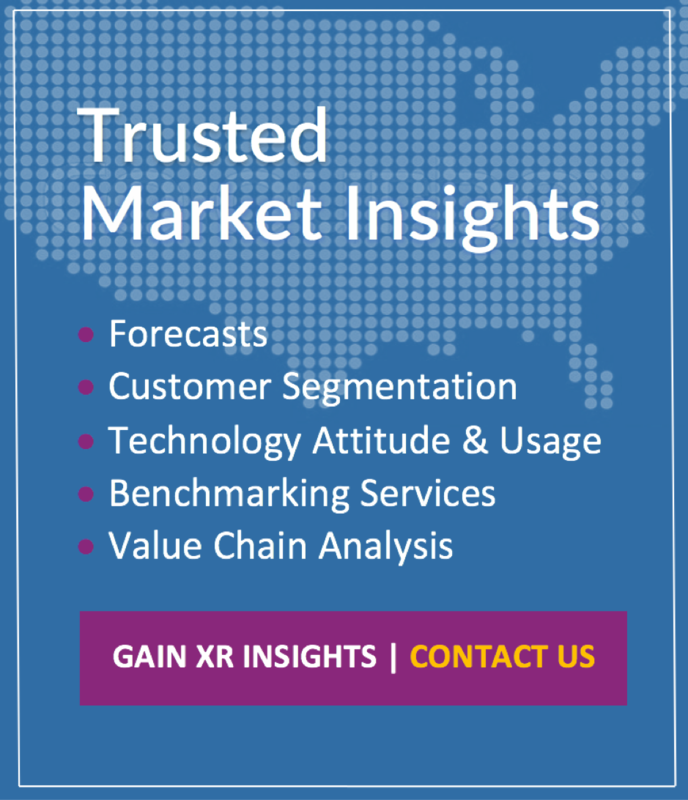 Greenlight Insights delivers critical strategic insights to the world's leading technology companies, publishers, service providers, institutional investors, and government entities. Based in San Francisco, with offices in Boston and Denver, Greenlight Insights comprises a diverse team of highly skilled industry professionals who offer deep expertise in virtual and augmented reality. To learn more about how we help decision makers navigate the future of xR, visit greenlightinsights.com.